RUBICON 10TH ANNIVERSARY HOOD & FENDER SET. YOU CAN CHOOSE ANY 2 COLORS. ONE FOR THE LETTERS AND ONE FOR THE OUTLINE. 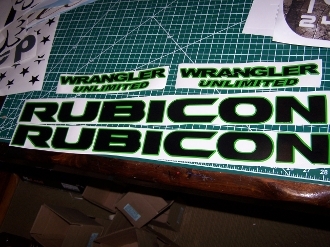 THESE DECALS ARE TO FACTORY SIZES.